The standard cosmology is the most reliably elucidated epoch, or era, spanning the time between about one hundredth of a second after the Big Bang through to the present day. The standard model for the evolution of the Universe in this epoch has faced many stringent observational tests. Having said that, the standard cosmology still has a number of unresolved issues. Particle cosmology builds a picture of the Universe prior to this at temperature regimes that still lie within known physics. For example, high energy particle accelerators at CERN and Fermilab allow us to test physical models for processes which would occur only 0.00000000001 seconds after the Big Bang. This area of cosmology is more speculative, as it involves at least some extrapolation, and often faces intractable calculational difficulties. Many cosmologists argue that reasonable extrapolations can be made to times as early as a grand unification phase transition. Quantum cosmology considers questions about the origin of the Universe itself. This endeavours to describe quantum processes at the earliest times that we can conceive of a classical space-time, that is, the Planck epoch from the beginning of the Universe to 0.0000000000000000000000000000000000000000001 seconds after its beginning. Given that we as yet do not have a fully self-consistent theory of quantum gravity, this area of cosmology is more speculative. 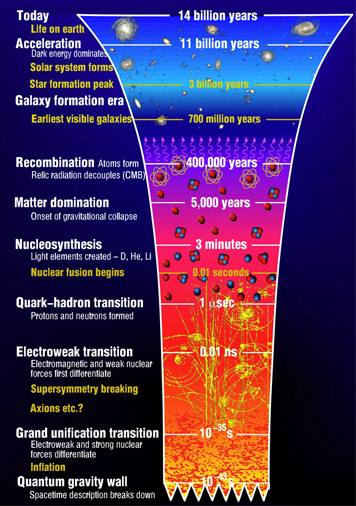 The diagram here illustrates the main events occurring in the history of our Universe. The vertical time axis is not linear in order to show early events on a reasonable scale. The temperature rises as we go backwards in time towards the Big Bang and physical processes happen more rapidly. Many of the transitions and events in the picture will be explained through these outreach pages. The timescales and temperatures indicated on this diagram span an enormous range. A cosmologist has first to get the order of magnitude (or the power of ten) correct. Quantities which are given as 10 to some power 6 (say) are simply 1 followed by 6 zeros, that is, in this case 1,000,000 (one million). Quantities which are given as 10 to some minus power -6 (say) have 1 in the 6th place after the decimal point, that is, 0.000001 (one millionth). At extremely high temperatures we tend to use gigaelectronvolts (GeV) instead of degrees Kelvin. An electronvolt is the energy gained by a single electron as it moves across one volt. One GeV is equivalent to about 10,000,000,000,000K, or 1013K.